Are you working in tough conditions where you have to stand the whole day? If yes then you need to understand that your toes and ankle are in constant threat of getting hurt. We would suggest you to buy safety boots which provide incredible safety to your feet while providing them comfort and the best suggestion here would be full ankle protection boots. Most industrial safety shoes are genuinely defensive; however numerous employees out there require an extra layer of security. What's more, for those employees, full ankle protection boots are the appropriate response. The main component they would need to look in a couple of work boots would be a safety steel toe as it saves your toes in case of an overwhelming burden falling on them. 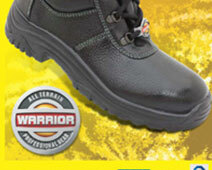 With our steel toe full ankle protection boots your toes are saved! Likewise going for an extraordinary quality outsole would be a great thought as this element gives traction and an awesome anti slip and abrasion properties. 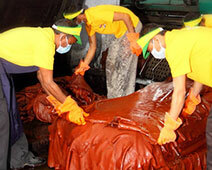 Additionally, being chemical and oil resistant, it keeps them away from getting inside. Safety shoes are an investment and durability has utter importance since workers cannot buy these shoes again and again. Our full ankle protection boots are produced using materials of high strength that can persevere through extraordinary conditions. The sewing of the shoe is done fantastically, which will evade the wearing and tear of the boot. Although, the materials used to make these boots are sturdy and guarantees durability yet there’s one thing that is necessary is the comfort of these industrial safety shoes. Realizing that workers ordinarily work in shifts of twelve–hours a day, their boots need to remain comforting for long working hours. Well-designed padded soles can extraordinary help in each step of the laborer's way.